BAGHDAD (IRIN) – As the Iraqi army and affiliated militias sweep into northern Iraq to try to re-take the city of Tikrit from so-called Islamic State (IS), the local civilians are fearful they may be punished for the crimes of the Islamist militants. A force of around 30,000 made up of army soldiers and government-backed Shia militias today moved to reclaim the city, 150 kilometers north of the capital Baghdad, which fell to the predominantly Sunni militant group – previously known as ISIS – last June. Ghanim Al-Ajeeli, a Sunni tribal sheikh from the Albu Ajeel village north of Tikrit which has up to 20,000 residents, said he feared being held responsible for the actions of IS. He said his and other families were fleeing to the Tuz district ahead of the assault reaching the area. Followers of Islam fall under two main sects: Sunni and Shia. Since taking over swaths of territory in northern and western Iraq in June last year, Sunni IS has routinely brutally attacked Shia civilians, as well as Christians and other ethnic minorities. It has also targeted Sunnis who oppose it. Human rights groups have accused Shia militias of routinely abducting and killing Sunni civilians in recent months. Many of the militias have long existed in Iraq, but have risen in power and prominence after the Iraqi army retreated and allowed IS to claim nearly a third of the country. Militia members, numbering tens of thousands, often wear military uniforms and are allegedly supported by the government but operate without any official oversight. Joe Stork, deputy Middle East and North Africa director at Human Rights Watch (HRW) said he worried this trend would be aggravated during the assault on Tikrit. “We are very, very concerned on the basis of what has been going in the past few months,” he said. Unless the militias can be brought under control, he added, the military should carry out the offensive alone. A HRW report released last month documented Shia militias taking revenge on civilians they deemed to have been favourable to IS. In Muqdadiyya, area of Diyala province 80 kilometers north of Baghdad, militias allegedly set homes on fire after claiming the area. 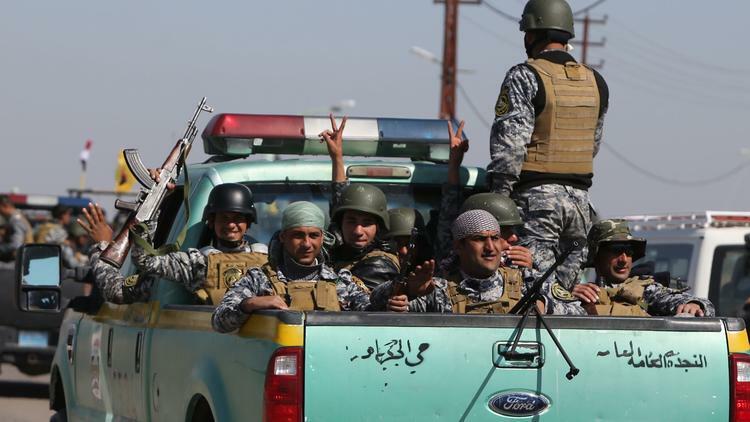 Fears of a revenge attack are particularly strong in Tikrit after the so-called Speicher massacre. Last summer, IS allegedly killed more than 1,000 predominantly Shia soldiers after it captured the Speicher military base in Tikrit. Both Iraqi President Haidar al-Abadi, himself a Shia, and senior Shia leader Ayatollah Sistani have made speeches in recent days urging militias to act with restraint and respect civilians. Since Iraq’s civil strife in 2006-8, politicians on all sides have increased their use of militia-fueled violence to further their political ends. Shortly after coming to power last summer, al-Abadi pledged to bring the militias under control and incorporate them into the government security services, also promising to prosecute those who had committed crimes. But Stork argued Abadi had yet to seriously challenge the power of the militias: there have been no confirmed cases of militia leaders being punished by the legal system. Hakim al-Zamili, head of the Iraqi parliament’s security and defense committee and a member of the political party led by Shia cleric Muqtada al-Sadr, denied there was any lack of discipline among militias. But it is no compensation to Ajeeli, who fears potential massacres. “I think they will commit crimes to be written in Iraq’s history for hundreds of years”.